Spurs at the Take-a-Liberty Stadium. Swansea and I have a lot in common. We were both the victims of a recent robbery. My house was burgled last week while I was sleeping, and my laptop, mobile phone, a fistful of cash and my dignity were stolen. For Swansea it was more of a mugging when they were beaten in the last moments of a match they had monopolised for long periods at what we could call the Take-A-Liberty Stadium. You have to be a very one-eyed Spurs fan to think that Tottenham deserved to take all three points yesterday. The Swans, swinging in the rain, made and missed enough chances to have won the game in a canter before Christian Eriksen repeated what is becoming his happy habit of plundering a late winner. The victory moved Spurs up to seventh in the Premier League table, and on the surface all looks promising as we go into the busy Christmas programme. One thing�s for sure, they have character in abundance as is proved by the way they keep nicking victories when many of we faint-hearts have surrendered. But poke below the surface and we find major problems. The centre of the defence comes open as easily as Simon Cowell�s mouth, the midfield lacks guile and style, and if it wasn�t for �One Of Our Own� Harry �Hurrikane� Kane the attack would be toothless as well as clueless. As I said last week to the annoyance of some of you, what was once Fortress White Hart Lane has become as welcoming as a bouncy castle to visiting teams. I make no apologies for joining Emmanuel Adebayor in admonishing those fans who jeer when they should cheer and spread a mood of negativity when positivity is the necessary currency. Among the teams soon coming to the Lane in successive matches are Manchester United and Chelsea. Anything but top-drawer performances against them will be punished with the ignominy of defeat. The old White Hart Lane support and spirit will be vital. First of all though there is Wednesday�s Capital One Cup tie against Newcastle, followed by easy-on-paper matches against Burnley at home and a Boxing Day visit to bottom-of-the-table Leicester City. We could go into the New Year with the whiff of a Champions� League place in our nostrils, yet it is obvious that there are holes in the squad that need urgent repair work. The January transfer window is going to be fascinating. I am sure Mauricio Pochettino is fighting to get the players he wants to make the Poch Plan work. He must have looked on enviously as Wilfried Bony � top Premier League marksman in the calendar year � struck his 20th League goal of 2014. This came in the 48th minute after he had missed a hat-trick of chances in the first half. It cancelled out Harry Kane�s powerfully headed goal in the fourth minute, the highlight of yet another totally committed performance by the home-made hero who is growing in stature with every first-team appearance. While Bony cost �12-million and was a constant menace, Tottenham�s �26-million Roberto Soldado was virtually invisible, and for the second successive match looked a forlorn figure as he was summoned to the bench. We all want popular Bobby to find his goal touch, but you get the feeling Pochettino�s patience is running out with the suddenly shot-shy Spaniard. It would be a coup to buy Bony, but there�s probably more chance of signing Boney M.
The jury is still out on Erik Lamela, a box of tricks who too often can�t get the lid open. He was twice lucky not to get shown a red card against Swansea, first for a spiteful elbow in the face and then for a reckless two-footed tackle that could easily have broken a leg. Yet the referee Bob Madley each time decided to show clemency, when it was obvious he should have been giving marching orders. It was not only Bony who would have been watched with envy by Pochettino and Spurs fans. We all liked the cut of the jib of Swansea�s midfield general Gylfi Sigurdsson. How on earth did Spurs let him get away while hanging on to so many faceless midfield players? Something to bring a smile to our faces was the positive comeback performance by Kyle Walker, and his left back partner Ben Davies had an excellent game against his old Swansea team-mates. One rescue act against Bony in the first-half must go down as arguably the outstanding tackle of the season. Swansea understandably felt victims of grand larceny at the finish, but at least they don�t have to change the locks on their doors. Does anybody share my concern about the centre of the Tottenham defence? Hopefully they will prove me wrong, but I just don�t see the partnership of Federico Fazio and Jan Vertonghen being a long-term fixture. They continually zig when they should zag, and keep getting lost in no man�s land. I have rarely seen a player at Premier League level as guilty as Fazio of ball watching. When he should be concentrating on man marking he is too often caught looking at the ball and not realising that his opponent has found valuable space. He is also too prone to committing himself to tackles when he should be staying on his feet and cramping his opponent�s movement. As for Vertonghen, his body language sometimes suggests he would rather be somewhere else. When he arrived from Ajax I considered him future captain material and a polished defender who was made for Spurs. But his performances this season have been unpredictable, and the impression he gives is that he is not as totally committed as when he first arrived at The Lane. I was asked on line which two defenders I would pair at the heart of the defence from all those I have seen since first watching Tottenham in their Push and Run championship season of 1950-51. My first top-of-the-head response was Mike England and Ron Burgess, two immoveable Welsh mountains. Mike took over from Double team hero Maurice Norman, and Ron was the driving skipper of the Push and Run side. But then I changed my mind and decided I would select Ledley King to play alongside England. What perfect partners they would have made, balanced and assured and authoritative both on and off the ball. You would never catch them ball watching. They would be too busy marking their man, and protecting their goalkeeper. Poor old Hugo Lloris is continually left to fend for himself. I just hope he does not get fed up and decide to take a trip to where the grass is greener. We need Hugo Boss. Please note that I can no longer guarantee getting the Spurs IQ book to you before Christmas, but it will make a great New Year read and test of your Tottenham knwledge! A donation for every copy sold is going to the Tottenham Tribute Trust to help our old heroes who have hit difficult times. You can only order it from http://www.normangillerbooks.com/spurs-iq/4554925859. I have called it Spurs IQ, because it gives a thorough test of your memory and know-how of all things Spurs and also serves as a journey � even an odyssey � through the Tottenham ups and downs of the eventful post-war seasons. 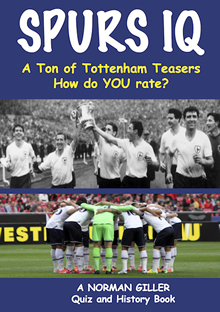 Tottenham Teasers are running throughout the book in unison with tales of the club�s ups and downs, and there is a Spurs IQ ratings table at the end that will give you a measure of your knowledge of the club, along with a Spurs IQ Masterclass test on the Legends of the Lane. I hope you will show true Spurs spirit and give your support to The Tottenham Tribute Trust and our old heroes from the glory-glory days. Last week I asked: Who scored 34 goals in 299 League games for Tottenham, was given the first of 30 England caps by Terry Venables, and also played for Portsmouth, Birmingham City, Wolves and Bournemouth? Most of you got it right, dear old Sicknote Darren Anderton, who was a magnificent player when fully fit. Many people think he was given his unique nickname while at Spurs, but he had already collected it at his hometown club Portsmouth because he spent so much time in the Fratton Park treatment room. The first name chosen at random from the correct entries: Jamie Barton, of Wealdstone, who wins the autographed copy of Lane of Dreams. This week�s teaser: Who scored scored 62 goals in 118 first team games for Spurs, made the squad of 40 for the 1974 World Cup finals, later played for Derby County and managed Ipswich Town?